The New Larger 5 ML Latisse, Is It Worth It? Is offering Allergan's new 5 mL Latisse size worth the extra expense for your patients? Allergan launched on August 1, 2012, a larger 5 mL bottle of Latisse in the USA. The original sized bottle is 3 mL. Latisse (bimatoprost ophthalmic solution) is a FDA approved drug to treat inadequate and aging eyelashes. Approved in December 2008, over 3 million kits have been sold with approximately 500,000 users. It is estimated that 1 Latisse kit is sold every 30 seconds. The new 5 mL Latisse comes with 140 brushes for 10 weeks of manufacturer suggested usage, as opposed to the 3 mL version which comes with 60 brushes for about 4 weeks of manufacturer suggested usage. At this point, there is a choice to puchase 5ml or 3ml bottles of Latisse. The suggested retail for physicians to sell at their offices for a 5ml bottle of Latisse is $179 versus $120 for a 3ml bottle. But, it's not just the price and volume of Latisse that has changed. Patients now get more brushes per ml than before. There are 28 brushes per mL as opposed to 20 brushes per mL. I think many patients will appreciate having more brushes - especially those who are using one brush per eye as recommended by Allergan. Looking at this a different way, if Allergan had kept the ratio consistent, the new number of brushes for the 5ml bottle should be 100 brushes, not 140. With extra brushes, patients will be more likely to follow the one brush per eye suggestion by Allergan. For 5 mL bottle, the usage is suggested for 10 weeks. For a 3ml bottle, the usage is suggested for one month (roughly 4 weeks). There is 67% more volume in the new product. If we increased the duration of usage proportionally, we would get almost 7 weeks of usage for the new larger sized product, not 10 weeks. Perhaps this is a strategy to help alleviate the confusion of patients who find ways to make the original sized Latisse last longer than the recommended duration of usage. When buying things in larger quantities, we usually get a chance to save money; there's less packaging that's duplicated, there's less motions that a staff person has to go through to make a sale, and there's fewer trips a client has to make. The list price in a physicians' office of the 5 mL Latisse is $179 which represents $4.20 savings per mL over the previous 3 mL version's list price. Plus, the patients get the added value of having more brushes. At this list price for the larger Latisse, it is the equivalent of buying the smaller Latisse at $107.40 considering only the volume of Latisse. Physicians also save on the overall cost per mL of the product when they buy it directly from Allergan. This means, that the users of Latisse stands to potentially benefit with the passed on savings. Allergan also has other incentives for the physicians and patients, such as their Brilliant Distinctions program which will most likely be geared toward their new product. What can we achieve with a bigger bottle of Latisse? Many first time buyers of Latisse usually start with one bottle of Latisse. Latisse usually takes about 16 weeks to reach full efficacy. With the 3 mL sized Latisse, one doesn't get to full efficacy. But now with the new size, patients will get much closer to 16 weeks than before with just one bottle. I think this new product could be positioned as an excellent product for first time users. Patients are less likely to drop off because they didn't see the most impressive results. We could even bundle a 5ml plus a 3ml Latisse kit together for a "full efficacy" deal. Are there any drawbacks to having a larger sized Latisse? There may be potential confusion with staff and patients regarding the different costs and different brush to volume ratio. But I think if patients want to compare, they should just drill it down to the cost per mL, and know that they are getting more value by having 40% more brushes than if they had just bought 3 mL kits. I've also used Latisse as a way to generate more traffic in my office. With fewer refills, I am going to get a bit less traffic. The size of Latisse increased 67%. The number of brushes increased 133%. The recommended usage duration increased 150%. 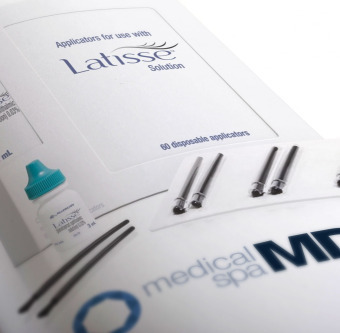 The list price of Latisse dropped 12% per mL. Patients who try Latisse for the first time will find greater satisfaction from their first purchase. Patients and physicians will also enjoy specials offered by Allergan regarding the launch of their new sized Latisse. I think the benefits of lowered cost and higher initial patient efficacy outweigh the minor drawbacks of product confusion and diminished foot traffic. I initially thought that it would be a hassle to have to add another product to our inventory, but after working out the pros and cons, I will be eager to add the 5ml size to my collection of retail products.